Ranchi, 12 October : To mark the second anniversary of the Right to Information Act (RTI), 2005 a symposium was organised by the Jharkhand RTI Forum in association with Gram Swaraj Abhiyan at Sandhya Tower, Ranchi. The benefits of the use of RTI including the future course of action were discussed during the symposium. 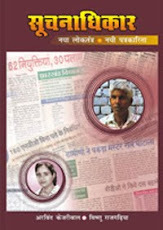 Senior journalist and Resident Editor of Dhanbad and the convener of Jharkhand RTI Forum, Vishnu Rajgadia said, “The RTI Act has done miracle, it has provided benefits to the applicants in all areas.” He stressed the on the need to use RTI and felt that it would definitely provide the result if properly dealt with. The President of Chamber of Commerce and Industries, Arun Kumar Buddhia was present on the occasion that also stressed the need for the consistent use of RTI. Advisor to the Commissioner of the Supreme Court, Balram, said, “ We need think on the positive note about the RTI and its uses.” Senior journalist Sudhir Pal gave the examples of the RTI by Manthan Yuva Sansthan to collect information. Gopi Nath, Mritunjay Sharma, Shakti Pandey , Nilima Upadhya including others were present in the symposium.